International Journal of Research in Health Sciences,2015,3,2,247-251. 1-Post Graduate Resident, 2-Professor and Head, 3-Associate Professor, Department of Community Medicine, Christian Medical College and Hospital, Ludhiana, Punjab, INDIA. Background: Hypertension is inadequately controlled in most patients due to poor treatment adherence. Not much is known about current status of treatment adherence. Objectives: Present study is aimed at finding the status of adherence to treatment and control status of diagnosed hypertensive patients in a rural community in Ludhiana, Punjab. 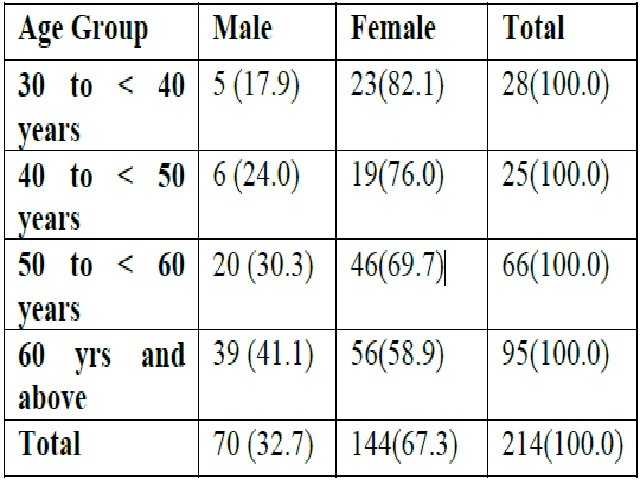 Materials and Methods: This cross-sectional study was conducted in the rural field practice area of Community Medicine Department of Christian Medical College, Ludhiana, over a period of one year. A house to house survey of 214 diagnosed hypertensive patients was conducted. After obtaining their informed consent the participants were interviewed, using a predesigned, pretested structured questionnaire. After completing the interview, one blood pressure readings was recorded in sitting position in the right arm using an electronic BP monitoring device. Treatment adherence was assessed using the Morisky Green Scale. The data was entered and analyzed using Epidata entry and analysis. Results: Only 4.7 % of respondents achieved blood pressure control with treatment. Fifty three percent of respondents had low treatment adherence, according to Morisky Green Scale. Conclusion: The rural population of Ludhiana has a large number of hypertensive patients, most of whom have low treatment adherence. This necessitates appropriate strategies to improve treatment adherence and blood pressure control.